1Tap the Settings card bundle and then tap the Head Wake Up Settings card. This card shows whether the feature is enabled and also shows its wake angle — the angle at which you need to tilt your head to wake the device. 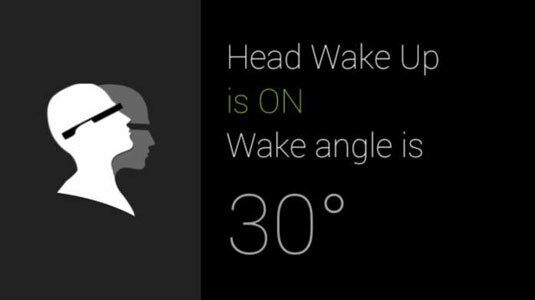 2When the menu appears, swipe forward to find and tap Set Wake Angle. 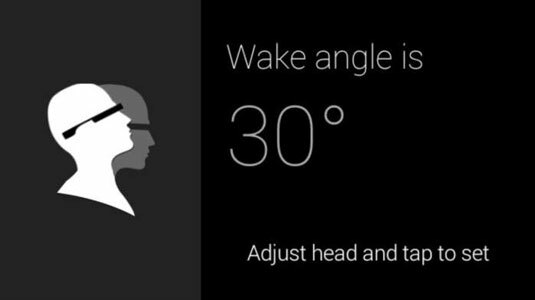 By default, the wake angle is 30 degrees. Fortunately, Google recognizes that you may not find this setting comfortable, especially if you tilt your head often. 3Tilt your head to the angle you’d like to use to wake the display. The angle size appears in degrees onscreen as you move your head. When you feel comfortable with the angle, set it by tapping the touchpad.